The terror of prehistoric skies may have not been able to fly? The Quetzalcoatlus, named after the frightening Aztec God, was a ptrodactyloid dinosaur known for being the largest creature to ever take flight. 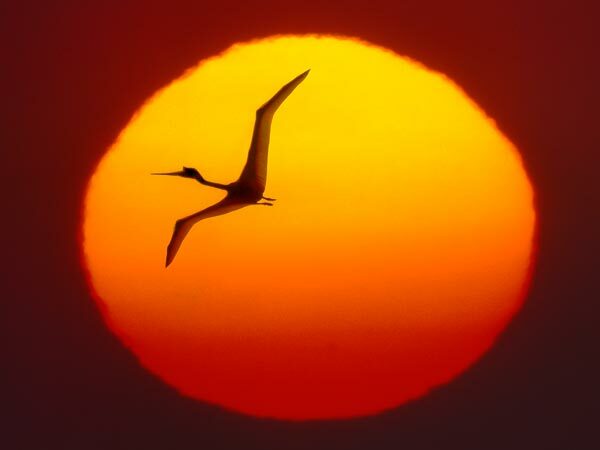 A radio-controlled model of Quetzalcoatlus northropi, digitally superimposed over a picture of the sun. With an astonishing wingspan of 40 feet and a weight of 400 pounds, these species must have been incredibly feared as they soared through the skies in search of food. Right? Well, maybe not! Up to this date, the biomechanics behind the giant ptosaurus flight remains a mystery. Some paleontologists are even struggling to decide whether this bewildering creature was in fact able to flutter across the sky. Leading scientists have claimed that this ancient reptile, which could grow to the size of small airplanes, was simply too heavy to fly. According to their research, ptrodactyls were not able to flap their wings fast enough and generate sufficient thrust to maintain their enormous bodies airborne. Yet, Michael Habib, from the Johns Hopkins Medical School in Maryland, argues that the Quetzalcoaltus simply relied on updrafts of warm air and wind currents to sustain flight. “They probably only flapped for a few minutes at a time … and then their muscles had to recover,” he said. “In between, they’re going to use unpowered flight” and glide. On the other hand, experts, who do not question the Quetzalcoatlus’ ability to fly, are still not capable of describing how this creature could take-off. Some researchers speculate that they could not take off from the ground as birds but instead had to drop from trees or cliffs to start their journey. Yet, Habib and and other scientists believe that, like mother bats, “large pterosaurs may have used all four limbs to launch themselves into the air before flapping their wings.”By analyzing the shape of the pterosaur arm bones, Habib discovered that these creatures possessed incredibly strong arm bones that could power them into the skies. As this video explains, their take-off could have been explained by 4 simple steps: stance, crouch, vault, and launch. However, just because they were strong enough to do so does not mean they actually took off through a quadrupedal launch. Copious paleontologists remain unconvinced by Habib’s theory . “When I read the manuscript, my first reaction was, ‘Hmm, that’s odd.’ But if you work on pterosaurs, you get used to odd things anyway,” remarks David Unwin, a paleontologist at the University of Leicester in England and author of the book The Pterosaurs: From Deep Time. “Large and giant pterosaurs pose a problem,” he explains, “because the flying speed they need to achieve is quite high, 30 or 40 miles per hour, and I have a hard time understanding how they get that fast from a standing jump.” Kevin Padian, paleontologists of the University of California, Berkeley, is also quite skeptical about Habib’s conclusions. Padian says he believes the smaller pterosaurs bipedal and therefore took off with two legs instead of four. Further research is obviously needed in this field in order to solve the mystery of this prehistoric legend. Current theories may be able to explain the biomechanics of this bird, yet up to this date, no one has been able to prove them. … the half-size replica finally crashed.